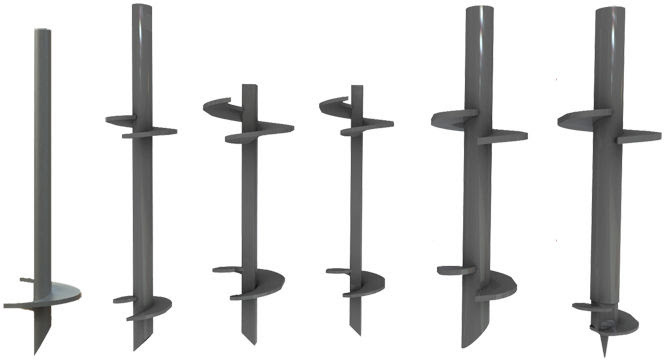 Helical Screw Pile Systems Provided by Advanced Mini Piling Systems: History of the Helical Screw PileThe basic principle of the Screw Pile was first developed in England by an Irish engineer in the 1900’s to stabilise light houses. Utilising the same idea we start of with a lead section, with a number of helix’s on, ( depending on load ) screwing the Pile down, until the permitted torque kN is attained, if this is not the case we continue to add sections via bolting the spigot end to the socket cap end of Pile section, screwing the pile down into the underlying strata until our design torque kN or depth M is reached. 89mm Round HS Pile with Rock tip, being installed into ballast with a 22kNm Torque head, mounted on an 8.0t Komatsu, in Battersea Park, London. 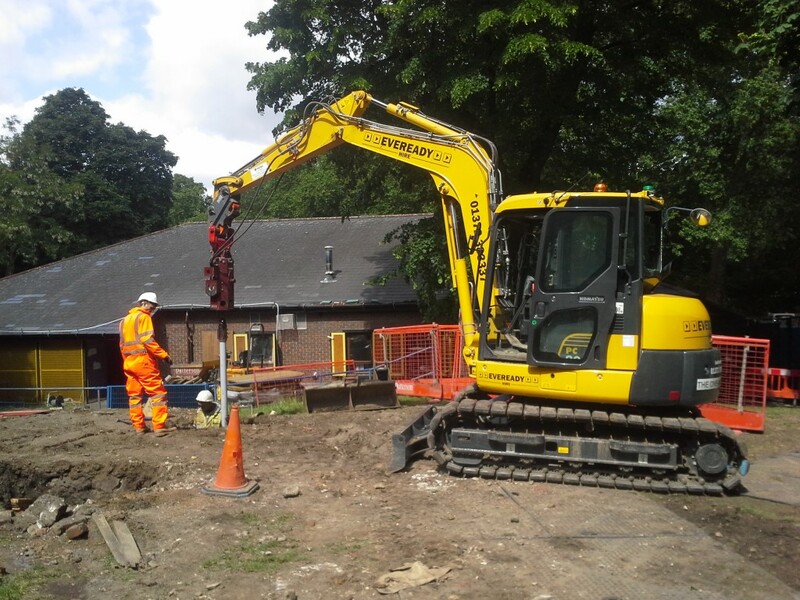 Advanced Mini Piling Systems can install a varied range of Helical Screw Pile Systems, with sizes ranging from 38mm Square Shaft and 60mm Round Shaft, which are installed by hand, micro digger or any other hydraulically powered equipment, to larger diameters exceeding 600mm in diameter, which needs 30t excavator with a torque head of over 300kNM.The range of Screw Piles we provide can be installed, with varying sizes of machine. Depending on the foundation system required and the impact on the surrounding environment. We can install Helical Screw Piles with machines as small as 750kg and as large as 30t depending on the compression and tension of the required load.Each project is individually designed by our engineers and the Screw Piles are designed to suit your projects criteria, when designing your project, our experienced team will visit site, factor in access, time schedule, ground conditions and cost, which will provide you with the most economical solution to your foundation requirements.Applications for Helical Screw Pile Systems:*Underpinning*New build foundation support*Road side structures*Rail side structures*LV/ HV power industry*Telecom industryFor more information on our Piling Systems and Services or helpful advice please Contact us.